What I heard wasn't him actually talking. 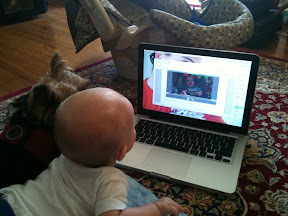 Somehow he had opened the video of him saying Momma, started to play it and was watching quietly. He LOVES watching his video! He watched it the other day at Memaw and Papaw's, too.